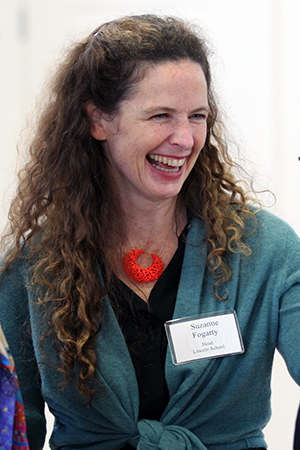 Suzanne Fogarty, Lincoln's dynamic Head of School and a thought leader in girls' education, offers her perspective on everything from current events to what's currently on her bookshelf. Read on for the latest and greatest! Today, October 11, is celebrated as The International Day of the Girl. This year’s theme—With Her: A Skilled Girl Force—asks that everyone stand with girls globally as they rally together, creating and celebrating a potent force for change. Is the World Ready For Lincoln Girls? Head of School Suzanne Fogarty asks: is the world ready for a next generation of girls that speak their truth, know their power, and are poised to change the status quo? Read More about Is the World Ready For Lincoln Girls? All Smiles: Head of School Suzanne Fogarty Visits Grade 2! Is there anything better than spending time in the classroom with the students who make Lincoln so special? Read More about All Smiles: Head of School Suzanne Fogarty Visits Grade 2! There is an abundance of fabulous schools in Providence and in Rhode Island, but what we are doing here cannot happen anywhere else: At Lincoln, girls come first. Find out all the ways that makes a difference that lasts a lifetime. Suzanne Fogarty joined the national conversation around the recent controversial decision to allow girls into the Boy Scouts. In an op-ed entitled "The All-Girls Advantage: Why the World Needs the Girl Scouts" featured by the Girl Scouts of Southern New England, Fogarty focuses her attention on the unique and powerful environment that only all-girls organizations can provide. Read on! Education is a marathon, not a sprint. At Lincoln, the empowerment of girls and young women is at the heart of our mission, and the new banners on Butler Avenue and Blackstone Boulevard remind all who drive by that Lincoln students are the bold minds, global thinkers, creative problem solvers, and future leaders of our world. Lincoln is not only on the move, but on the city, state, and national maps as a thought leader in independent school education. As the head of Lincoln, people sometimes ask me: “Why all girls?” The distilled answer is: the purpose of Lincoln’s mission is to empower girls and young women, and when it comes to education, research shows it doesn’t pay to be gender blind. Exciting things are already afoot this year at Lincoln! I’m pleased to share that on New Year’s Day I was included in an incredible lineup of Rhode Islanders who were named “R.I. Innovators: 11 Trailblazers to Follow in 2017” by the Providence Journal. It is thanks to the collaborative work of the Lincoln School community that I received this honor. As a Quaker school for girls, our foundation allows us to provide a space in which to have productive conversations about our personal beliefs without excluding others. Today, as all days, we are a community committed to peace, equity, and inclusion. I’m pleased to share that we are nearing the completion of our Facilities Master Plan that we began in earnest last winter. A Board of Trustees committee led the collaborative process in which the needs of the community directly influenced the 10-year plan for our campus. Proudly. Peacefully. Purposefully. This is a Lincoln education, an education that is much more than its academics, its arts and its athletics. The city of Providence, like Lincoln School, has been the recipient of some excellent press recently. Providence got a full-page write up in the Wall Street Journal titled “The Perfect Long Weekend in Providence” (9/28/14).